When it comes to creative appetizers, these bacon wrapped Brussels sprouts with maple syrup are sure to steal the show. Get the instant appeal of bacon, the savory greens of the sprout, and a dash of maple syrup all in one easy finger food. 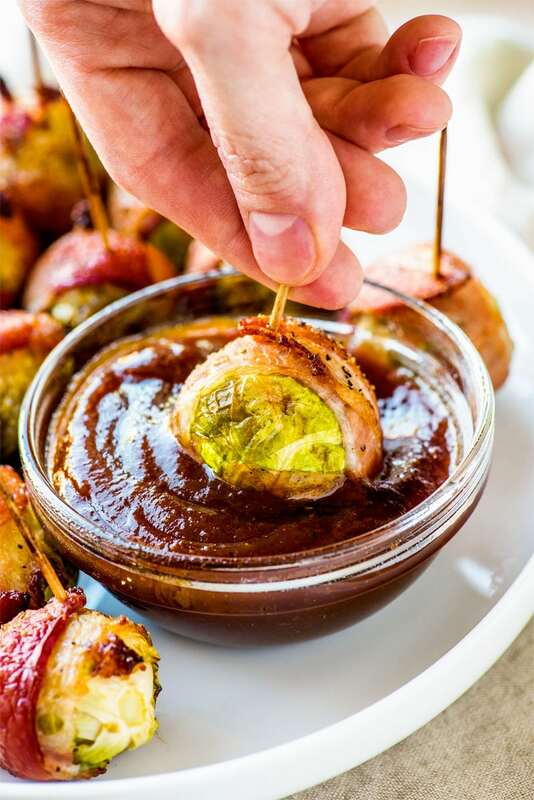 If you’re searching for a new finger food to serve at your next party, then look no further than these bacon wrapped Brussels sprouts. Brussels sprouts? Really? That vegetable that so many of us weaved and dodged as a kid, you want us to serve it at a party? A party everyone is trying to have fun? Yes, that is the vegetable and I am 100% endorsing you to feed it to all your friends. And, better yet, I am certain that it will be the hit of the party. Because not only is this appetizer easy to whip up, but it will also blow your taste expectations out of the water. When it comes to appetizers, my fondness for them is based on how easy they are to make, and that’s totally the case with these bacon-wrapped beauties. If I haven’t already sold you on giving this appetizer a try, the ease of making them will seal the deal. First off, collect and prepare all of your ingredients. This includes trimming fresh Brussels sprouts (or thawing a bag of frozen ones) and cutting the raw bacon strips in half. Next up, lay the bacon strips out and generously brush them with maple syrup. Place a single Brussels sprout on each piece of bacon, pull up the ends of the bacon to wrap around the sprout, and then secure it with a toothpick. Finally, arrange the bacon wrapped Brussels sprouts on a baking sheet, season with salt and pepper, and place them in the oven to bake. Typically 30 minutes should be enough time to get the bacon crisp and the sprouts tender. When ready to serve, place the bacon wrapped Brussels sprouts on a decorative plate and serve with a dipping sauce of your choice. What dipping sauce should you use? This appetizer works the sweet and savory angle, and because of that, I recommend using a dipping sauce that does the same. Or, better yet, serve both a sweet and savory dip and let your guests decide! Try any (or many!) of the following and see which one is gone first. A trusty knife for preparing the Brussels sprouts and bacon. Toothpicks for securing the bacon around the sprouts and for easy eating. Depending on which Brussels sprouts you buy, you may need to cut the stems and remove the leaves. If you’ve never done this before, check out this guide on How to Trim and Cut Brussels Sprouts. As you’re cutting the bacon, keep an eye on the fat. If needed, trim away excess fat to keep the width of the bacon to about one inch. Preheat oven to 400 F. Line a baking sheet with aluminum foil, then set aside. On a flat work surface, lay out halved bacon slices. Using a pastry brush, generously brush each slice with maple syrup. Place a Brussels spout in the center a slice of bacon, then lift up the sides of the bacon to wrap it around the sprout. Use a toothpick to secure the two ends to the sprout. Transfer prepared bacon wrapped Brussels sprout to prepared baking sheet. Repeat this step until all sprouts have been wrapped. Bake bacon wrapped Brussels sprouts for 30-40 minutes or until bacon is crisp and the sprouts are tender. Let bacon wrapped Brussels sprouts rest for 5 minutes, then transfer to a serving plate. Serve with a dipping sauce of your choice. You totally had me at bacon wrapped. Plus I love that you brush the bacon with maple syrup before wrapping. These sound delicious! “When it comes to appetizers, my fondness for them is based on how easy they are to make” Exactly Not only with appetizers whatever the recipes if its easy i just love it. And since appetizers are something which i try to make often , i usually search something new and easy.Thank you so much for sharing this easier one.